Finally! Something on which the esteemed Senate Republican Leader agrees with The Curmudgeon! Term limits have been a disaster invisible to most people, invisible because most people don't actually watch the day-to-day operations of state government. But ask anyone who watches government on a daily basis (elected officials, journalists, bureaucrats, lobbyists ... anyone!). Virtually all of them will tell you term limits are a very bad idea. The idea of term limits was to bring fresh blood into public office. It was inspired by a handful of longtime legislators who were beloved by their constituents and reviled by the rest of the state, and pushed through by a coalition led by the Michigan State Chamber of Commerce. Even the Chamber now admits it was a huge mistake, and for many years has supported eliminating or at least expanding term limits. Here's the deal: despite popular opinion, there is a skill-set required to be an effective elected official. You need to know about policy, group decision-making, coalition building, and the mechanics of a $40-billion organization. But most people think that it's an easy gig, full of easy decisions. So they are willing to elect people from all sorts of backgrounds totally unrelated to what is a challenging job. They are generally very bright, motivated people. But too many of them spend a lot of time in the beginning realizing they don't have a clue how to make the system produce results. It is high-level on-the-job training. Like many people who move into new careers they ultimately get the hang of things and become capable of getting results. And then, when they get good at the job. they are automatically fired. Tell me: when you are looking for an electrician, auto mechanic, landscaper, hairdresser, doctor, plumber, whatever -- do you insist on hiring someone with little or no experience, and force those with experience to find another line of work? Of course not. But that's how we treat public officials. It is stupid. Compare Michigan's last five Governors. William Milliken, John Engler and Jim Blanchard came to office before term limits, each with lots of government experience (Engler had held public office since he turned 22). All of them were very effective. Then came term limits: Jennifer Granholm followed by Rick Snyder. Smart people, two folks with the best of intentions, but neither really had a clue how to be an effective Governor. Their skill-set did not include having to cope with 148 other elected power-brokers. Both of them went through a big-time learning curve. Same problem with the last several House Speakers, all of whom didn't have the seasoning needed to be really effective because a House member has a maximum lifespan of six years, meaning the Speaker has a maximum of four years experience. No recent House Speaker can compare with the leadership of folks like Paul Hillegonds, Bobby Crim and Bill Ryan. 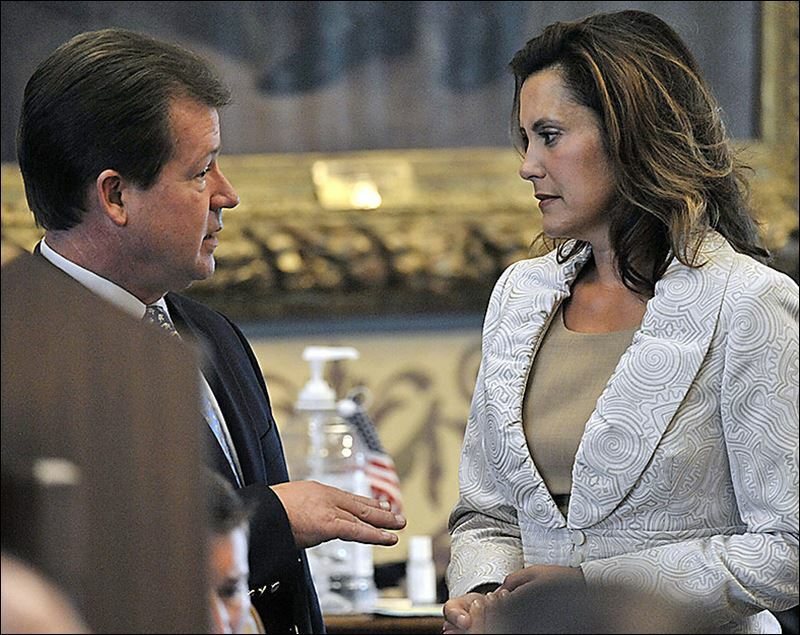 At the end of this session, the Constitution will terminate both the Senate Majority and Minority Leaders: Randy Richardville and Gretchen Whitmer. (House Speaker Jase Bolger is also termed out). Richardville and Whitmer have very different political points of view, but both are very experienced, effective and respected leaders. They are good at their jobs and, given the chance, their constituents would gladly reelect them. But they cannot. That is an unwise and unnecessary waste of talent and experience. The Curmudgeon lives in Lansing. and spent most of his adult life in and around state government. In his lifetime, he has seen some truly excellent legislators in both parties. Among them: David Hollister, Lynn Jondahl, William Sederberg, Debbie Stabenow and John Engler. All of them served a long, long time in the Legislature because they were good at their jobs, and because the people they represented liked the job they were doing. Each left a lasting legacy. It can take a lot of time to change state laws significantly. Hollister, for example, spent nearly a decade working on Open Meetings and Freedom of Information laws which set a standard for the nation. With today's term limits, he would have been gone before passing those bills. It used to be that the state's top experts on the complex world of school funding were experienced legislators. Now, the experts are the lobbyists and the bureaucrats. Lawmakers, for the most part, have little expertise in complex issues like K-12 funding, higher education funding, public health policy and myriad other arcane disciplines. Term limits also discourage a lot of people from running because it makes political office a career-interruption, not a career change. The only people who see it as a career move are those with an eye to cashing in on their time in elective office by taking a high-paying lobbying job. Instead of "why not the best?" our political mantra is "why not the available?". It is just one example of why the term "career politician" is a compliment, not an epithet. A career politician stakes their professional life on doing a good job as a legislator. A hobbyist legislator is more focused on their next gig, because they know their tenure in office is guaranteed to end quickly. If you want better government, managed by people with high levels of skill AND knowledge, you should support ending term limits. If you want a government run mostly by amateurs, stick with term limits.